After months of convincing your CEO, they’ve finally approved your team’s request to go to the epic #INBOUND18 event this year (September 4th - 7th in Boston). Ecstatic, you exchange high fives with your teammates, book the flights and hotels, and start your countdown clock to the event. Instead of getting back to your regular work routine, you’ll want to take some time to plan for your week at Inbound before you go. Why? Trust, us, you’ll be glad you did. INBOUND has become one of fastest-growing business events of the year. It’s a fantastic chance for marketing teams to learn, network, and create meaningful relationships. What’s more, over 21,000 people attended the event last year from 100+ different countries. That’s a whole lot of sales, marketing, and customer success pros all in the same place! Budget investment: Your company will likely be paying for your transportation, accommodation, food, and miscellaneous things while your team attends INBOUND. For smaller marketing teams with modest budgets, this is a big investment -- you’ll want to make sure you’re getting the best return on investment from the event. Planning your days in advance will help keep your team's budget in check. Time: In addition to investing money, having you team away for a week at Inbound means that you won’t be fully able to attend to your regular work. Be sure to plan ahead so you can adjust deadlines and work around the event. So now you know why you should plan for INBOUND, but how can you make the most of your time there? In this blog post, we'll share our own tactics pre-, post and during the event to help you get the absolute most of your time at INBOUND '18. Let's jump in. Define your objectives and strategy. Whether you’re looking for new customers, partners for your affiliate marketing program, or just planning to learn new marketing strategies, going to Inbound can help you tremendously. Before heading off to Boston, get your team together to review your marketing objectives and figure out how what you will do at the event to achieve them. Our team’s main objectives are to learn new content marketing strategies and to find new co-marketing partners. So once we set those objectives, we drafted out the next steps we will take to help us get there. What do you plan to achieve at the event? How will you use the event to help you achieve your business objectives? How will you measure your achievement? Now that your objectives are set, it’s time to follow through with the next steps. Create valuable content before, during, and after. Create different images you can use across your website, in social media messages, and in email signatures. These promotional images should encourage people to reach out to you and connect at the event in person. Be sure to include a CTA of how they get in touch with you either before or during the event. Before the event: Write a blog post to help the organizers to create buzz and promote the event(like this one!). You can provide your experiences from past editions as well as new strategies you plan on testing out at this event. During the event: With so many talks and workshops going on at the same time, it’s impossible to do everything. Live-blogging during the event can help other event attendants catch up on what they’ve missed in the sessions they couldn’t attend. After the event: Sum up your experiences from the event by writing a recap blog post. This can include your summary of the best talks, workshops and the key takeaways you gathered. Got a great piece of downloadable content that is related to the learnings? Add it in! Let your customers and users know that you’ll be attending the event by sending out a dedicated email. If you were thinking of hosting an user group or a customer meetup, this helps you put some feelers out to see who would be interested beforehand. Live content is an excellent way to engage your audience with the event. Try doing AMAs, interviews and tweet chats with event speakers and influencers using different platforms such as videos, Facebook Live, Instagram Stories, and Snapchat. A lot can happen and change during the time leading up to a large scale event. New keynote speakers could be added, venues can change, and there could be side networking gigs that you didn’t know about. You’ll need to be a part of the event conversation in order to know what’s going on, but also to network and engage with attendees. For these reasons, it’s important to follow the event hashtag on social media closely, and this is where social listening will come in handy. After the event, you can create a recap report with the event hashtag (#INBOUND18). Show interesting insights such as how the volume of event hashtag evolved during the event, which influencers were mentioned the most, and which social platforms were most used to talk about it. Finally, turn all of this valuable data into a blog post or downloadable PDF so you can get even more out of your experience. See different sessions from your teammates. One of the challenges about going to large events is that there are way too many great speakers and sessions to see, usually all at the same time. Life is hard, we know. And one of the great things about going to events with a team is that you can divide and conquer! As you can’t possibly attend every session, split up with your team so you can learn different things from different talks. Be sure to jot down key takeaways from them and have a debriefing session over coffee or lunch the day. To go one step further, plan a knowledge sharing or retrospective session with the rest of your team who couldn’t attend to share your key learnings. I’ve personally made this one of my objectives for Inbound, so my teammates will be holding me to it! Everything about events is digitized nowadays. From the organization, scheduling, to networking, everything can be done without interacting with someone in person. This makes the face-to-face aspect of attending events extremely valuable. Social media is fleeting, so it’s a good idea to give people you interact with something physical that will remind them of your interaction. Whether it’s a business card, pens, or USB drives -- who doesn’t love free event swag? If you’ve never ordered event swag before, try to go for something out of the ordinary. We all have enough tote bags! FYI. We’re bringing macarons from Paris. Do we have your attention now? 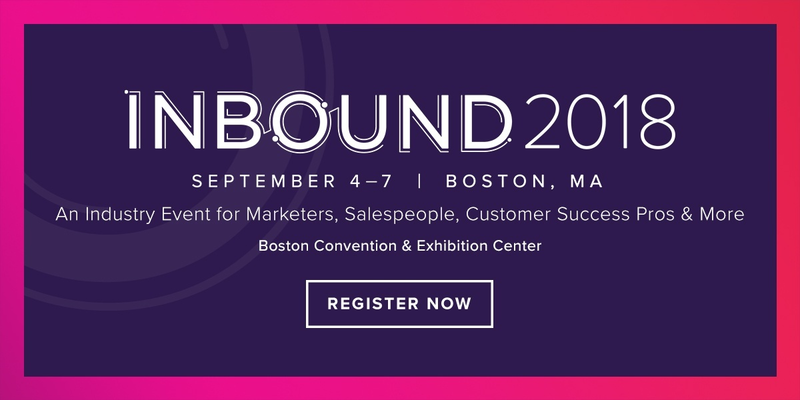 Are you prepared for INBOUND18? Don’t let time leading up to INBOUND18 pass you by! Make the most of your time by using some tips from this guide to prepare for your trip. Start registering for the sessions you want to attend, reach out to people you want to connect with, and track the conversations around the event.